Last night's multi-disciplinary evening of music, film and poetry at Harbourfront Centre's Enwave Theatre would have been more apt a performance to stage during last weekend's Nuit Blanche. It has a lot going for it: masked musicians playing to a backdrop of a live-mixed film, as well as the most controversial poem of our time recited live with accomplished jazz musicians. The show, presented by Artistic Director Andrew Burashko's The Art of Time Ensemble, starts and ends with two contrasting works from Pulitzer Prize winner and Grammy Award winner George Crumb: Black Angels and Vox Balaenae (Voice of the Whale). The first piece is inspired by whale song, and uses conventional instruments (flute, cello and piano) to create the most otherworldly sounds. 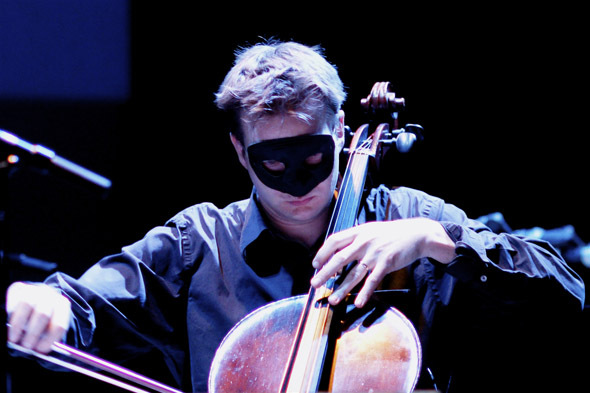 Perhaps most unusual a sight is to see the musicians on stage playing wearing masks. The performance features a live, improvised filmscape by Peter Mettler, possibly best known for Gambling, Gods and LSD or his cinematography in the recent Manufactured Landscapes. What steals the show is a dramatic reading of Allen Ginsberg's Howl by Dora awardwinning actor Ted Dykstra, accompanied by bassist George Koller, trumpeter Michael White and pianist Jonathan Goldsmith (who scored the film Away From Her by Toronto's own Sarah Polley). Goldsmith also composed the musical accompaniment for this piece, which adds immeasurably to the performance, making it worth the price of admission alone. After the intermission there's a change of pace, with Andy Maize and Josh Finlayson of The Skydiggers take the stage to sing a bunch of protest songs by Bob Dylan and Woody Guthrie. The songs strike a chord between the era the songs were written and today's war-riddled times, making way for the Black Angels piece, featuring the versatile Tokai String Quartet, whose finale to the evening's program is a delight to both listen to and watch. The piece was originally created in 1970 and inspired by the shocking horror of the Vietnam War. Crumb's inventive use of instruments and sounds, including crystal glasses, gongs and maracas in addition to shouting, chanting whistling and whispering create a most haunting soundscape that -- accompanied by the backdrop of Mettler's film -- evokes a powerful commentary on our times. Still craving a little art fix after Nuit Blanche? Take in this performance tonight for its last show. Tickets are $36, but just $25 for students (or seniors). Take your mom or grandma for thanksgiving! She may be offended by some of the colourful language in Howl, but she'll forgive you for it by the show's end. Show starts at 8pm at the Enwave Theatre at Harbourfront Centre, 231 Queens Quay West. Box office: 416-973-4000.